Every Android Enthusiast loving to hold a latest Nexus device as it includes best from the Google android, Google this time decided to choose Huawei world’s 3rd largest Smartphone brand to launch Nexus with latest Marshmallow. Huawei Nexus 6P has great specs like 5.7 inches AMOLED display, Snapdragon 810 octa core processor, 12.3 MP and 8 MP camera, 32/64/128 GB ROM, 3 GB RAM and 3450 mAh battery. 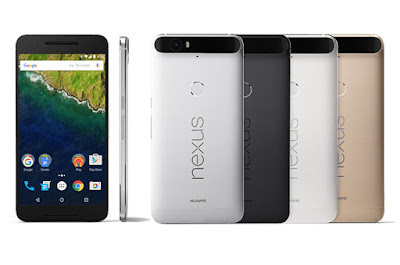 Here we will have Short review, Pros and Cons of Huawei Nexus 6P. Huawei created a design that looks different from previous Nexus devices which are looking similar; they made it with the Anodised Aluminium, after being metallic built, 5.7 inches size and 3450 mAh battery Huawei maintained its thinness and weight 7.3mm and 178 grams respectively .From backside area is raised near the camera to improve its aesthetic value and just below camera Fingerprint Sensor is fixed and a large Nexus branding is also there below fingerprint sensor. Phone feels premium to hold in hand but for ladies it may be tough task to operate this handset with one hand just because of size. There’s a volume rocker and a power button on the phone's right edge and headphone jack is up top, USB Type-C port on bottom. Other thing about this handset is rumour that mentioned phone get bend and the Gorilla glass get shattered easily but i don’t think its common case; if you force to bend any Smartphone it will either bend or break. Let’s come to its brilliancy in 5.7 inches AMOLED display which is featured with resolution of 1440 x 2560 pixels (qHD) and 518 ppi display density that pixels are unrecognizable with the naked eyes. The display is bright, sharp and fully capable to deliver pleasing user experience; although there is seems lil problem in the Ambient light sensor which is always not adjusting auto brightness correctly. Google always try to give an idea by a Nexus phone how a standard Android phone should be. So definitely has a powerful processor that can handle more and more heavy applications as well as multitasking. Huawei Nexus 6P powered by the Snapdragon 810 octa-core processor having 2.0 Ghz of the clock speed; as it has marshmallow which has capability to automatically disable unwanted apps so this powerful processor along with 3 GB of RAM gives flawless experience in day to day task, there need not to worry about the any kind of the hiccups. The camera is Smartphone department where customer as well as companies giving a lot of focus, obviously this Nexus is improved a lot from its previous handsets. They have beautifully located 12.3 MP rear camera (1.55µm) in raised strip. This is stunning camera giving possible detailed information about the scenery even in indoor low light photographs. The one thing missing in camera is OIS especially when the camera switches to record videos. Battery has a great capacity of 3450 mAh that gives a good 4.30 - 5.30 hours Screen on time (SOT) with introduction of Doze in Marshmallow that reduces unwanted load in battery and CPU by switching the apps that are not in use, with moderate use it gives the backup of 1 full day. Design and built quality is quite impressive. 12.3 MP primary and 8 MP secondary camera is eminent. Google included both a Type-C-to-Type C and a Type-A-to-Type-C cable in the box. Battery charging can be rapidly with type-c cable in 80 minutes. Fast and Responsive fingerprint sensor. The aluminium unibody feels great to touch. Does not have FM Radio. No Expendable memory card slot. OIS is missing in camera. Ambient light sensor does not working perfectly. You will happy to hold a Nexus device with improved camera, classy premium build and smooth performance running marshmallow Android version, it’s all the rumour that Nexus 6P bend bla bla. If you are searching for a large nearly tablet size android handset this is surely for you. Although there are some tough competitors already existing in market as recently we have found HTC One A9 a great alternative to this handset.